Now that the broadband stimulus money has been distributed, and the Google fiber initiative has taken root in the two Kansas Cities, a lot of communities seem to have lost interest in broadband initiatives. The cable companies have done a fairly good job of keeping up with demand, and the telephone companies continue to cling to their share of the broadband market by competing on price rather than on bandwidth. But this apparent "Remain calm! All is well" approach is the calm before the storm. And the storm is coming to us in a huge cloud. In the past week, Amazon and Apple have rolled out new cloud-based initiatives that will stream content everywhere, all the time. If cloud storage seems like a gimmick, it is not. It is the answer to the utter uselessness of trying to keep all our media content, personal and business, on local hard drives. Music, pictures, movies, and what we used to quaintly call "TV" are driving this problem. Even though you can buy a two terabyte hard drive for $150, you can fill it faster than lickety-split with purchased video. And then you have to figure out how to back it up. Backing it up with a second drive is a good start, but suppose your house or business burns down? Both drives are gone, as is all your data. Add to that the fact that everyone now wants everything available on every computing device they own, which typically comprises, for many people, FOUR devices: a smartphone, a laptop, a tablet, and a desktop computer. And the portable devices will never have enough storage to keep everything on the device itself. So the cloud is not a typical IT solution in search of a question. We know what the question is, and the cloud is the answer. But streaming everything to everyone all the time is going to create, over the next several years, exponential increases in demand for bandwidth. And that's when the copper-based DSL and cable modem networks will run out of steam. Communities that have not made plans to ensure a modern fiber-based infrastructure that also supports ubiquitous wireless mobility access will be at a severe disadvantage from an economic development perspective. Oh, and one more thing. There is another sleeper in the battle for streaming content....Rhapsody (the music service) just bought Napster to try to fight Spotify. Spotify is a streaming music service that is huge in Europe but only recently began operations in the U.S. So the music industry is still undergoing a massive reorganization that is focused on streaming any song ever recorded to anyone, at any time, anywhere. And it is going to be a battle of Titans, with Apple, Amazon, Rhapsody, Spotify, and even tiny Microsoft with its Zune music service all going head to head. I'm tweeting the Net-Workshop (9/19/11) in real time if you want to follow it (@designnine). Net-Workshop is a one day meeting of community broadband leaders from around the country. I had a conversation last week with a new college grad who had just started a new job and had moved into a new apartment. The young woman had a couple of questions about her Internet connection, which she had purchased from the local phone company (DSL). I asked if she had considered a cable TV/cable modem package. She said, "No, I never watch TV. I can get whatever I need from the Internet." In a nutshell, the customer base of the cable TV industry is getting old and dying, and they don't have a plan to attract younger customers. The National Security Agency has released a very nice set of tips for managing desktop computers and home and small office network devices like routers and wireless base stations. Here is the link, and I have attached it to this article. From the always funny xkcd....the whole East Coast was shaking from an earthquake centered in Virginia. Here is a picture of some of the damage in D.C.
"We just converted over to tiered pricing, data tiered pricing, because we see a huge wave of video coming. That's going to take a lot more capacity in the individual networks, and so I think for a lot of customers that won't be an issue from a revenue perspective. But, for the heavy users, we do see the revenue go up significantly." "...a huge wave of video..."
And that huge wave is also engulfing existing landline networks, not just cellular. It's why AT&T just called DSL "obsolete." With airline tickets for business travel now routinely topping $1,000, almost any business can recover the cost of a $3,000 or $4,000 HD videoconferencing system in just a couple of months. Fiber everywhere isn't just about making it easier to watch a Netflix movie in the evening, as some elected officials stubbornly maintain, it's about enabling commerce and supporting economic development. The CEO of AT&T has stated that DSL is "obsolete." In a speech on Tuesday in Los Angeles, Randall Stephenson said the telephone giant invested in DSL in the nineties to compete with the cable companies. AT&T is now concentrating on wireless and it's fiber to neighborhood offering called Uverse. Uverse continues to use copper from a neighborhood cabinet to the premises, making it less capable than fiber to the premises. Apple released the latest version of its Macintosh operating system today (OS X Lion). The software is available only via a download right now, and you better have a good, high capacity broadband connection if you want it, as the download is four gigabytes. Apple also announced that it will sell a version of the software on a USB thumb drive next month. In other words, no DVD version, not now, not ever. Apple has consistently led the way in media, including the 3.5 inch floppy, the CD drive, the DVD drive, USB ports, and Firewire, among others. If Apple is dropping the DVD, expect other computer makers to follow. But note also that this shift to encouraging downloads of major pieces of software also highlights the need for homes and businesses to have adequate and affordable broadband connections, or be left behind. Even more interesting, new Macs come with the ability to install the latest operating system from an entirely blank hard drive--as long as you have an adequate Internet connection. Cisco, the world's largest manufacturer of active Ethernet equipment, says that the historical trend of broadband data demand doubling every two years is continuing. The company expects the typical bandwidth need for fixed point broadband access (e.g. DSL, fiber, cable) to increase from 7 megabits now to 28 megabits by 2015. This paints a grim future for PON networks, which typically are designed to provide about 30 megabits of bandwidth to the home, meaning most PON networks will be obsolete in just three years. I think this is one of the reasons Verizon put a moratorium on extending their FiOS (PON) networks: they realized they were painting themselves into a corner with respect to bandwidth. Broadband Properties has published its March/April 2011 in parallel with the Broadband Properties 2011 conference in Dallas. 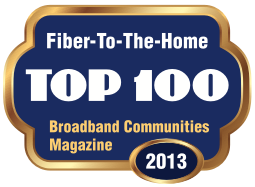 My article on "worst practice" in community broadband networks can be found on page 122 of the magazine, and is available online in the electronic edition. Rural residents are twice as likely to have much slower "little broadband" speeds than the rest of the U.S. Rural residents are ten times more likely to have no choice of providers than those in urban areas. From an economic development perspective, this is a slow motion catastrophe, as young people will leave rural areas without adequate broadband, and entrepreneurs and the self-employed will NOT move to rural areas with inadequate "little broadband." Meanwhile, legislators in North Carolina are throwing their rural constituents under the bus of broadband crony capitalism, with incumbents determined to protect their monopoly position in the marketplace at all costs.